Clipping Chix: Amazon: Lodge L9OG3 Cast Iron Round Griddle, Pre-Seasoned, 10.5-inch only $14.99 (reg. $24) + FREE Shipping with Prime! 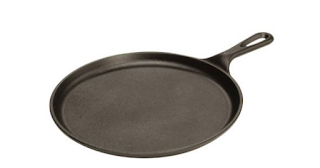 Amazon: Lodge L9OG3 Cast Iron Round Griddle, Pre-Seasoned, 10.5-inch only $14.99 (reg. $24) + FREE Shipping with Prime!